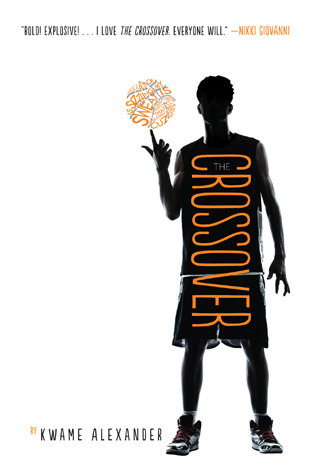 I first heard of The Crossover when it won the Newbery Award earlier this year. I didn't think any book had a chance of beating Brown Girl Dreaming, so I had to read it. This is another novel told in verse. Not just verse. The way the words are laid out, the letter zing off the page. I read it more in the rhythm of rap than poetry (although rap is a form of poetry), which is how I imagine Josh, the main character, would want it to be read. The book starts off with a swagger. You can feel it in the way its written. Josh is a young boy who knows who he is and how his world runs, and it's all fabulous. The swagger decreases as the book goes on and Josh's world changes and threatens to fall apart. to the finish with a fierce finger roll . . .
Josh is defined by his love for basketball and his family. He has a huge talent for basketball, and he knows it. He worships his dad who pushes him pretty hard in basketball, but Josh seems very receptive. He has a typical tween annoyance at his caring mother who pushes him to be responsible and focused on school, but you can tell that he secretly appreciates what she does. He views his twin brother Jordan as an extension of himself, which is why he has such a hard time adjusting to the fact that Jordan is now more interested in a girl than basketball. This book is really about change. Josh has to learn how to find a new equilibrium with his brother no longer thinking identically as him. He also comes to understand that his hero dad is a person with flaws and fears that can have consequences Josh can't control. Josh doesn't always react well to these changes in his life, but I loved seeing how he evolved over the course of the book and I got a glimpse of the good man that he will become some day. I think this book deserved to win the Newbery Award. Is it as good as Brown Girl Dreaming? No, not really. Don't get me wrong - it's wonderful and heart-wrenching. But Brown Girl Dreaming has already gotten loads of accolades (all deserved). The Crossover is also a wonderful book that deserves recognition. It's an artfully done book that is as good at substance as it is pretty prose. Ace maxs must be a reason why our human resources and our global rank in education are still low. One of the reasons is that our education is expensive. For middle up to high class people the cost of our education is nothing. I really liked this one too! I think it would be a great choice for a class readaloud. Such a quick read, I finished it in a couple of hours.